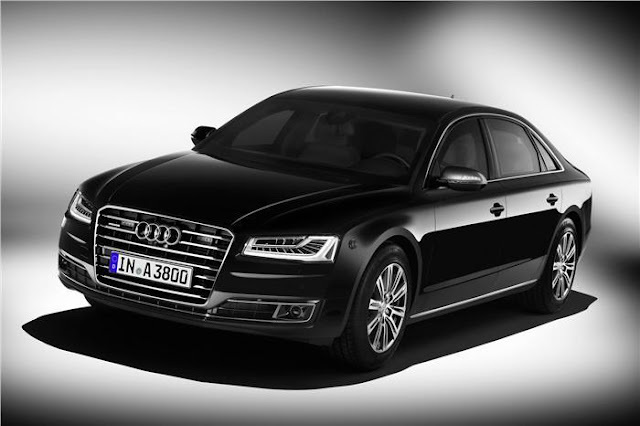 Apart from showcasing the all-new A4 and launching the second-generation of its R8 supercar in India at the 2016 Auto Expo, Audi has also launched the updated version its armoured limousine, the A8 L Security. The armoured limousine now gets upgraded ballistics protection and is priced at Rs 9.15 crore (ex-showroom, Delhi). The upgraded ballistics protection means that the car now provides VR9 level security to its occupants as against VR7 of the earlier model. Audi says that it has used a mix of materials such as aramide fabric, special alloys and hot formed steel armour to up the occupant protection levels offered by the sedan while also keeping its weight in check. The car comes equipped with an armoured communications box in the luggage compartment that houses the control units for the communication system, vehicle electronics, security features and an auxiliary battery. Standard features also include an intercom for outside communication with a speaker mounted behind the grille and selective door unlocking. Moreover, a patented emergency exit system, a fire extinguishing system and an emergency fresh air system are also offered as optional extras. Also available is a remote function that allows the driver to remotely start the car’s engine. The car offers all the luxuries of the standard A8 and can be further customised at the behest of the customer. Powering the A8 L Security is a 4.0-litre twin-turbo V8 engine delivering 429bhp of power and 61.18kgm of torque. There's another engine option on offer, a naturally aspirated W12 engine putting out 493bhp and 63.73kgm of pulling power. Top speed is electronically limited to 210kph. The car is also equipped with the company’s Quattro all-wheel drive system. The updated A8 L security rivals the likes of the Mercedes S 600 Guard that was launched last year.